Something emerges from the fog... something that should not be here. A sinister shape forms and you cannot believe your eyes! Master Yoda told you not to take any weapons with you into the cave. He warned you that inside you would find "only what you take with you." You are young and impulsive and you have not completed your training, so you charge in regardless and now, standing before you, is a figure that shouldnt be here, the menacing shadow of the Dark Lord of the Sith, Darth Vader!! Can it be? No... this apparition is something darker still... this is the pure dark side of the Force! Moreover, It is coming right at you!Sculpted by Gentle Giant's master artisans, this new Collectors Gallery statue recreates the scene from Star Wars: The Empire Strikes Back where Lord Vader suddenly appears before Luke Skywalker in the boggy Dark Side cave of Dagobah and silently challenges him to their first confrontation. 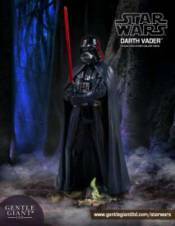 Vader, surrounded by the denizens of the swamp, ignites his fearsome red lightsaber and advances on our young hero!Each limited edition, hand-painted 1:8th scale Collector Gallery Statue is cast in high quality polyresin with crisp details. This statue also comes individually numbered with a matching Certificate of Authenticity. This Star Wars: The Empire Strikes Back Darth Vader Collectors Gallery statue continues our popular line of 1:8 scaled releases of a figure on a detailed, themed base and celebrates the last 40+ years of the Star Wars saga.